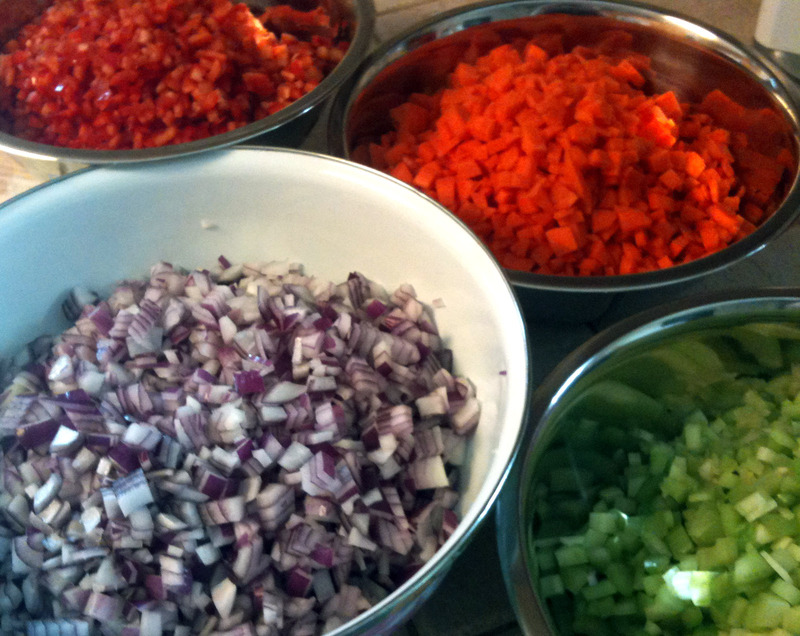 Fresh, great-tasting, GOOD-FOR-YOU soups & salads delivered right to your door! Grandma’s Cabbage Soup! 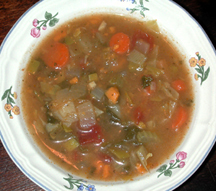 You know this if you have ever treated yourself to cabbage soup when you’ve been sick, or on a cleanse. It has souper powers! Let us serve you with a veggie brothy soup with cabbage, tomato, celery, onion, garlic, and herbs. Less than 90 calories per serving! 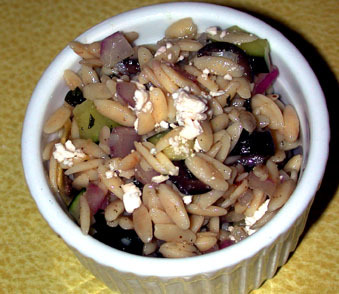 Greek Orzo Side! All things fresh, flavorful and filling! It’s an orzo (grain base), then filled with artichoke hearts, chickpeas, lemon, oregano, olives, feta, parsley, red onion, red pepper and cucumber. Don’t be scared at the 200 calories, just savor and realize its a meal! 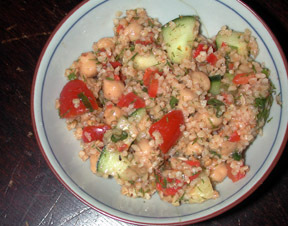 Includes: roasted red pepper couscous, with red onion, avocado, and cucumber rolled with crunchy romaine. Less than 350 cals/serving and served fresh and tasty!. Less than 350 cals/serving and served fresh and tasty! Less than 350 cals/serving and served fresh and tasty!! LO-CARB Option!! Substitute a bowl instead of tortilla if ordered by Saturday for next week. SAVES 150 calories!! Roasted Chicken Option!! Add fresh roasted chicken if ordered by Saturday for next week! Only $1 extra! Cari Green Salad! Our BIG green salads are fresh, seasonal, and diversified with a variety of veggies, protein, fiber and flavor! This week’s salad includes: apple, blueberries, tomato, carrot, corn, and sunflower seeds, with a very tasty Honey-Dijon dressing. (less than 270 calories/ container). You can ADD 64 grams of fresh roasted chicken to your salad for only $1.50! 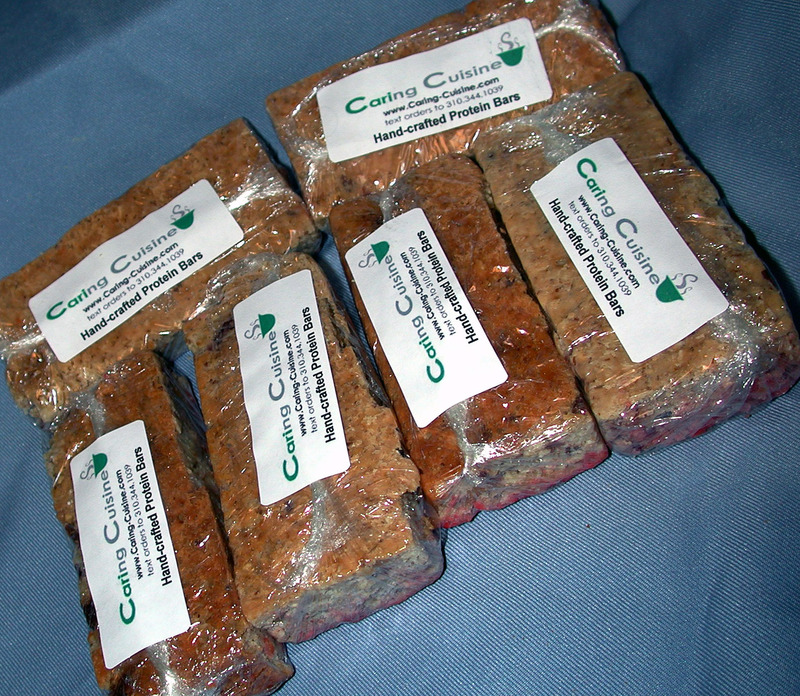 Natural Power Bars! Handy, tasty, healthy, and chemical/ preservative-free (so much better than the commercial ones that stay on the grocery shelf for a year!). Each bar contains 15 grams of protein and only 180 calories. This is a great snack/breakfast solution for busy day. This week flavors, as available: Cinnamon-Raisin . 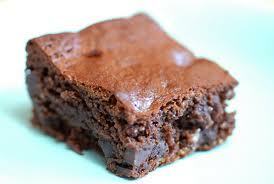 Energy Brownies! Everyone needs a treat now and then! Home-made and best e aten frozen, in my opinion! Just a few bites can satisfy your needs! A bit of cinnamon, walnuts n espresso make these treats special! 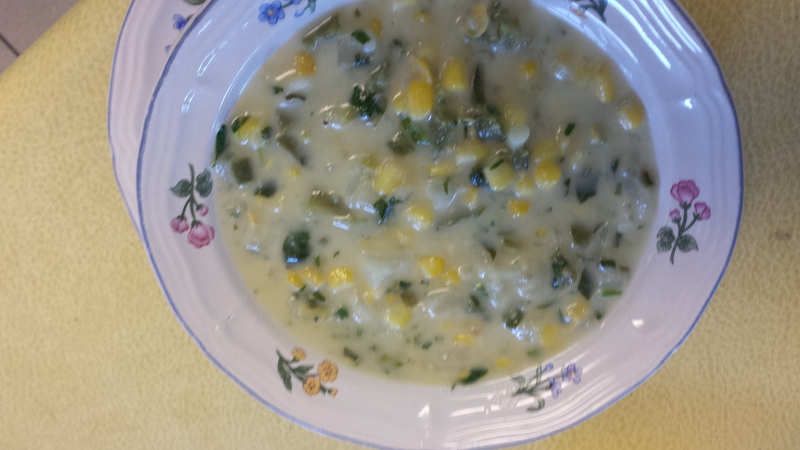 Mexi Corn Chowder! You know you want it. Warm tastes of peppers and cilantro with the comfort of corn -potato chowder. This was posted by Chef Shafer so you can trust it. Has dairy (and corn) in it. Yum at 240 calories. Apple Slaw! This sweet slaw has no dairy, but instead fills the senses with sweet-tart vinaigrette, apples, broccoli slaw, dried cherries/cranberries and sunflower seeds. This is really delicious! About 110 cals/per serving. Fresh Cilantro Hummus! Fresh green with cilantro, spicy with jalapeno and blended with lime, garlic, cumin, and chickpeas! Served with a stack of celery; it makes for a flavorful and healthy snack filled with fiber, protein and joy. YUMMY WRAPS! 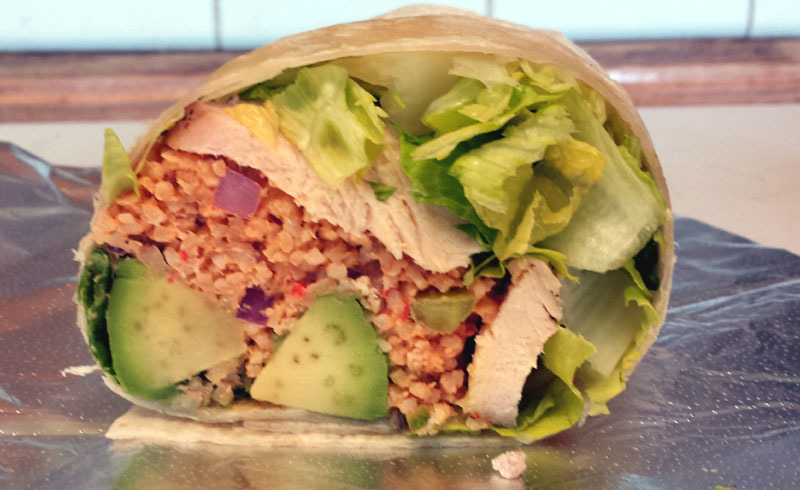 This week, try our Quinoa w/ Veggies Wrap/Bowl! Includes nutty quinoa, with caramelized onions/garlic, roasted red pepper, shredded carrot, slivered almonds, chili pepper, and fresh parsley, all rolled with crunchy romaine. Less than 320 cals/serving and served fresh and tasty! Catalina Green Salad! Our BIG green salads are fresh, seasonal, and diversified with a variety of veggies, protein, fiber and flavor! 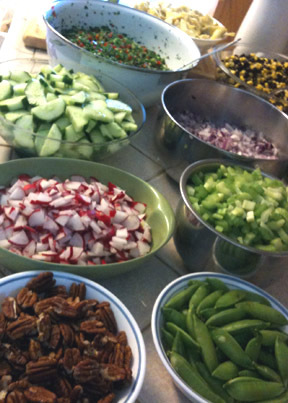 This week’s salad includes: black beans, red onion, avocado, cucumber, carrots, and radishes with a very a home-made smoky paprika dressing. (less than 240 calories/container). You can ADD 64 grams of fresh roasted chicken to your salad for only $1.50! Natural Power Bars! Handy, tasty, healthy, and chemical/ preservative-free (so much better than the commercial ones that stay on the grocery shelf for a year!). Each bar contains 15 grams of protein and only 180 calories. This is a great snack/breakfast solution for busy day. This week flavors, as available: Cinnamon-Raisin, etc . Energy Brownies! Everyone needs a treat now and then! Home-made and best eaten frozen, in my opinion! Just a few bites can satisfy your needs! A bit of cinnamon, walnuts n espresso make these treats special! Simply Veggie Soup! I suggest ordering by the quart, because it’s that yummy and a great solution for breakfast, a snack, or lunch/dinner. Only about 95 calories per serving! Yet, it’s filled with flavors from onions, cabbage, carrots, celery, roasted sweet potato & butternut squash, green beans, corn, tomatoes, etc. Dilly Garbanzos! So fresh and filling. We start with coarse bulgar and garbanzos, then add fresh tomatoes, cucumber, sun-dried tomatoes, roasted red pepper, lots of dill, and a balsamic dressing. About 200 cals/serving. YUMMY WRAPS! This week, try our Parmesan Wrap. A healthier version of this zesty classic. We include fresh couscous and wheat pasta with Parmesan cheese, marinara sauce, fresh basil, red onion, and some crunchy romaine. Less than 350 cals/serving and served fresh and tasty! Ceasar Green Salad! Our BIG green salads are fresh, seasonal, and diversified with a variety of veggies, protein, fiber and flavor! This week’s salad includes: tomato, red onion, green peas, cucumber, Parmensan cheese, and croutons (on the side) with a very tasty Ceasar dressing. (less than 270 calories/container). You can ADD 64 grams of fresh roasted chicken to your salad for only $1.50! Natural Power Bars! Handy, tasty, healthy, and chemical/ preservative-free (so much better than the commercial ones that stay on the grocery shelf for a year!). Each bar contains 15 grams of protein and only 180 calories. This is a great snack/breakfast solution for busy day. This week flavors, as available: Pumpkin-Spice and Almond-Cherry. 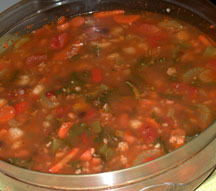 Chicken Sausage n Bean Soup! Very authentic to New Orleans; warm flavors of mild chilies, beans, hominy, kale, carrots, celery and the sweetness of more spices! Yum at 240 calories.! Three Plus Bean Salad! 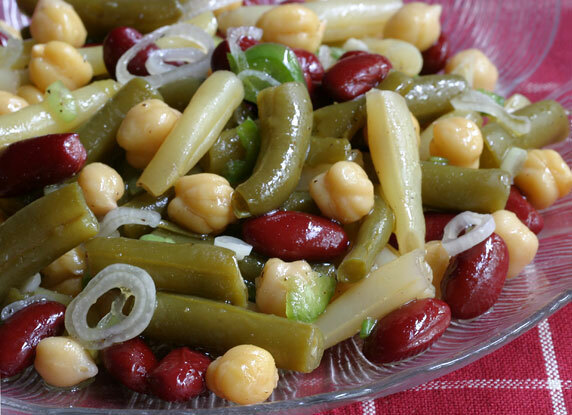 Our bean salad includes fresh green beans, kidney beans, garbanzo beans, wax beans, corn, white and green onion, in a sweet n tart dressing. Would be an excellent stand-alone side or a great topper for your green salad! About 150 calories per serving. Hummus w/ Pomegranate! Pomegranates are back in season for a limited time and hence why we are offering it again this week! If you have never tried this middle-Eastern combo, ya just gotta try it! 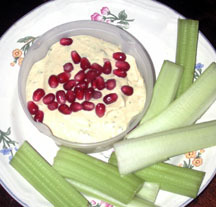 Home-made and delicious hummus with a sprinkle of tart-sweet fresh Pomegranate! 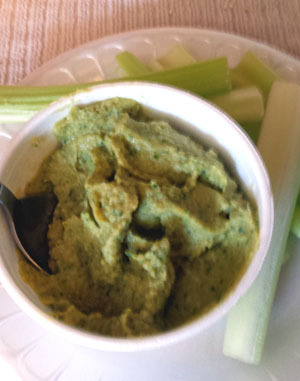 Served with a stack of celery stix, it makes for a flavorful and healthy snack filled with fiber, protein and joy. Chinese Bowl/Wrap! Includes: sesame couscous, with shredded cabbage, carrots, bell pepper, bean sprouts, and green onions, We provide an orange-ginger dipping sauce on the side. 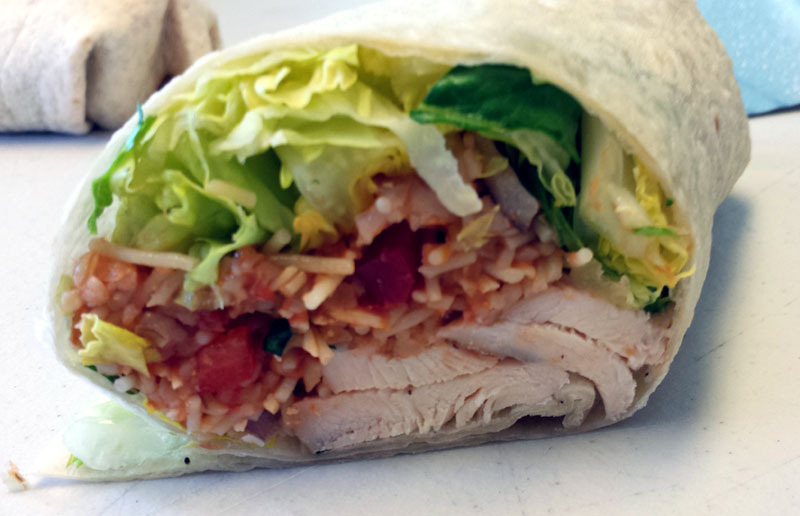 All rolled up with crunchy romaine and a flour tortilla. Less than 350 cals/serving and served fresh and tasty! Lemony Green Salad! 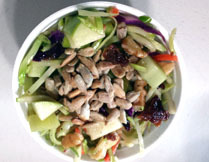 Our BIG green salads are fresh, seasonal, and diversified with a variety of veggies, protein, fiber and flavor! This week’s salad includes: zucchini, diced tomato, carrot, roasted almonds, green peas, and jicama , with a home-made lemon-thyme vineagrette. (less than 250 calories/container). 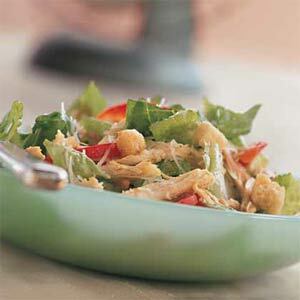 You can ADD 64 grams of fresh roasted chicken to your salad for only $1.50! Natural Power Bars! Handy, tasty, healthy, and chemical/ preservative-free (so much better than the commercial ones that stay on the grocery shelf for a year!). Each bar contains 15 grams of protein and only 180 calories. This is a great snack/breakfast solution for busy day. This week flavors, as available: Pumpkin-Spice.